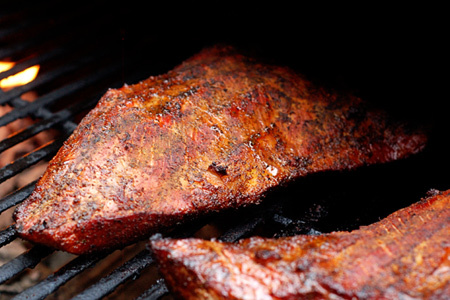 Last weekend I barbecued a couple tri-tip in real-deal Santa Maria fashion. Some of you might be familiar with my typical East of Santa Maria recipe. Well, this time out I simply used the Oakridge rubs that I recently reviewed, and I even cooked them over real Santa Maria-style red oak. I must say that the Oakridge Santa Maria Steak Seasoning really shined, although I had to cut it 50/50 with their Competition Beef & Pork Rub for the tender palettes. It's just a little too spicy for my girls. Note: In lieu of the Oakridge rubs, you can use a mixture of two tablespoons seasoned salt, two tablespoons chile powder, one tablespoon light brown sugar, two teaspoons dried marjoram leaves, two teaspoons granulated garlic, and one teaspoon dried parsley. This is just a rough estimate of the rub flavor profile. 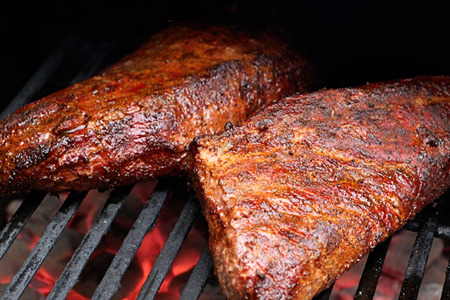 If your tri-tip are not trimmed of excess fat, trim them down to 1/8 fat at most. I got mine at Costco and they were very nicely trimmed. Mix the rubs or seasoning ingredients well in a small mixing bowl. 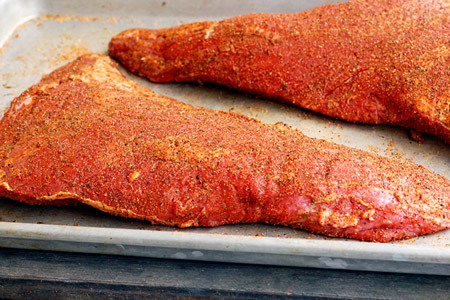 Season both sides of each tri-tip generously with the rub/seasoning. Put the roasts in a lipped pan, cover them loosely with plastic wrap, and let them sit at room temperature for about an hour before cooking. Start your grill and prepare for two-zone cooking (indirect and direct) at medium-high heat (375-400º). Cook the roasts indirect until the internal temperature in the thickest part of each is 127º. Move the roasts over the coals and cook them direct for about two minutes on each side. Remove the roasts from the grill, tent them loosely with foil, and let them rest for about ten minutes. Slice the roasts across the grain to about 1/4", and serve with your favorite sides. I had to come see what we missed out on. Well here's hoping that when Costco opens in Knoxville next year they start carrying tritip here. 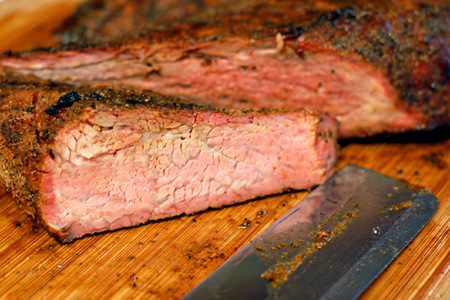 You can't find tri tip easily around here. What kind of cooker were you using? I don't recognize those wide grates. Chris - I used my old trusty Smoke'N Pit Pro (a.k.a. Black Betty) with aftermarket grates. I gave her a frame-off restoration last summer. Kevin - You can certainly cook it indirect on a gas grill and use wood chips as I describe here. Mesquite is a good choice if you can't find red oak.